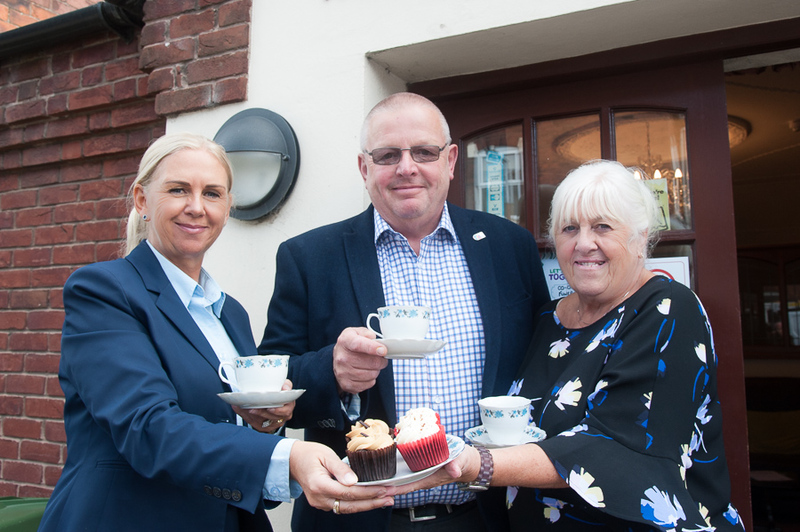 Well-known South Derbyshire businessman Pete Massey is to open a fundraising event at a Tamworth Co-operative Society funeral home as part of the World’s Biggest Coffee Morning on Friday, September 28. Mr Massey, owner of Masseys DIY, will cut a ribbon to officially open the coffee morning at Woodville Co-operative Funeralcare in Granville Street. Proceeds will go to the Macmillan charity to provide practical and emotional support for people affected by cancer. The event, which takes place from 10am to 2pm, is being hosted jointly with Woodville funeral celebrant Chris Knight who conducts services in the area. Cakes will also be delivered to local schools and businesses on the day to boost the amount raised. Woodville Co-op funeral director Lorraine Walker (left) and funeral arranger Sandra Wyatt will be serving up an array of tasty treats for the World’s Biggest Coffee Morning. Pictured with them is funeral celebrant Chris Knight who is helping to organise the event. Woodville Co-op funeral director Lorraine Walker and funeral arranger Sandra Wyatt will be waiting on visitors who call in for a cuppa and a cake in return for a donation. Chris’ wife Jayne, who is a keen baker, will be making a selection of cakes and there will be a raffle with prizes donated by businesses in the area, including the funeral firm which will be giving away a luxury hamper and two others filled with delicacies. Lorraine said: “Everyone is welcome to come and join us on the day in supporting Macmillan. This is the third year running we’ve held this coffee morning and have raised hundreds of pounds to date. We deal with lots of families who have been affected by cancer. So it’s a charity that’s very much close to our hearts. The work it does is vital in offering support to patients and their relatives. Amongst the prizes are a watch with a pearl bracelet from Baumgartens Jewellers, a chocolate bouquet from Weddings & Flowers R Us and a cushion from John Mills Curtains, all in Swadlincote. Other contributions include family tickets to Twycross Zoo and the National Forest Adventure Farm in Tatenhill, two tickets each to Kedleston Hall in Derbyshire and Warwick Castle, along with a presentation pack of beer from the National Brewery Centre in Burton, a £20 note, a bottle of Japanese sake, candles, cut glass and hairdresser’s vouchers. The annual Macmillan fundraiser generated more than £27 million in 2017 with individuals and companies all over the UK holding coffee mornings to raise cash for its nurses and other specialist services.